OLDRIGHTIE: A baskets And Stuff. The Cons And Dupe Machine Are Back from Hols! My post is mainly about the already powerful moves to blunt the Brexit vote but first I wish to dwell on Hilary Clinton. It is looking more and more as though she may not last the course. I do not relish any glee at the expense of anyone who is ill and suffering. Our lives are so short any moment lost to illness a great shame. This link is pitiful and very significant. I'm no medic but the episode looks very like someone suffering a stroke. Certainly not fainting as the idiotic PR pillocks are suggesting. This comes hot on a powerful gaffe she uttered in calling, as the Remain camp did and still do, voters supporting Trump as "a basket of deplorables". Regardless of that Americanism which converts adjectives to nouns on a regular basis, it was as though her campaign is mimicking the Remain habit of slagging off all who hold a different opinion. Whatever, her "episode" and her gaffe both point at a crisis for the Democratic Establishment Party. Big stuff indeed. As for back in good old Blighty. The Hindu origin of that word is something we shall need in spades to shake off the EUSSR shackles. No wonder Boris has made a call to arms as we read in this link. The prevarication over invoking Art 50, always suspicious, looks daily as a holding tactic by the Establishment. One cobbled together after the doomsayers' warnings of an immediate collapse after the leave win failed to materialise. Now that ridiculous woman Thornberry, an apt name indeed, mumbled about the "free market" being an essential part of any deals to be made. I may be wrong but I'll stick my neck out. Such a continuation of membership of this "market" would come with a huge plethora of legislation to be retained. Freedom of movement almost certainly a codicil. Both also demanding significant club membership fees and a minimal reduction in the army of Whitehall departments already sequestered to this blathering mess. Strewth, I could see a move to then retain the MEP presence on some pretence or other. Bingo, little, if any change. Down route we then can envisage a clamour for embracing the euro, shortly followed by a plea to restore full membership. All this done on the back of the next economic downturn. One possibly already engineered by Carney and the falling pound. 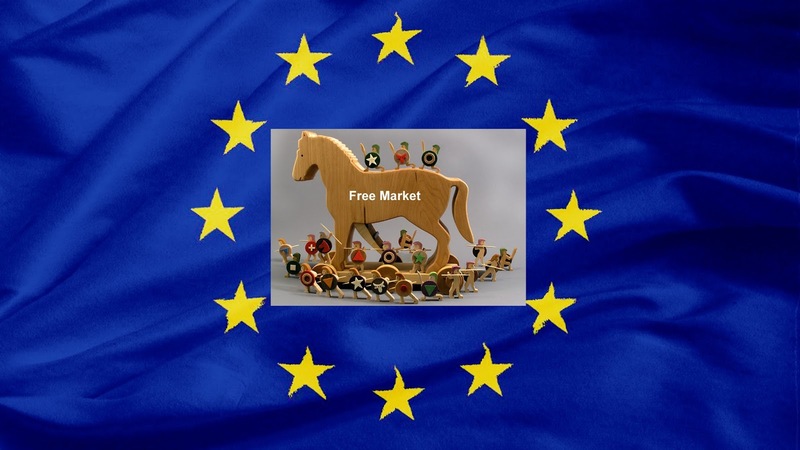 All in all, a Trojan horse emblazoned with "Free market" decals, shown above, seems rather apt, does it not? Mind you, Last Night of the Proms was wonderful. More please! Isn't that funny, boring, dull little blue flag a joke? I so want you to be as wrong as wrong can be, however i feel as you, and that foreboding, worsening every day is fed by constant snippets...access to free market being one of the many current clarion calls, all delaying tactics. I trust the sods about as far as i could chuck the lot of them. In the back of my mind i'm desperately concerned about UKIP, without Farage its rudderless, some of the bilge being spouted by the oh so obvious plants standing for leadership, for crying out loud, makes one want to vomit. 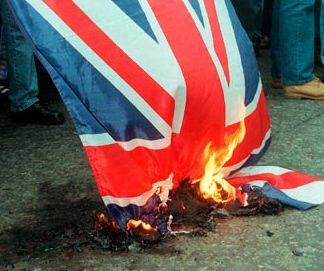 If and when it becomes obvious to all that Sharia May never had any intention of carrying out the wishes of the people, who exactly are we going to vote for come the next election, i want to bloody the tory nose again and again till they get the message that until they send the jackbooted ones by night to silence us permanently we aint going to shut up. Where have genuine conservatives like Jacob Rees-Mogg been hiding since the Brexit vote, have they been got at too, toe the party line sunshine or you're out next time? Hi, Judd. Isn't foreboding an awful state to have to live in?